The 18th century façade of Villa Mosconi Bertani. Villa Mosconi-Bertani is one of the most renowned and historical villas in Valpolicella, architecturally and historically the closest to the idea of a French chateau. The very history of Valpolicella and the Amarone is deeply rooted in this place with its magic atmosphere. Villa Mosconi-Bertani was built by Giovanni Fattori, a rich silk merchant, in XVIII century in a quite sober Baroque style typical of northern Italy. It is located in the center of the beautiful and peaceful Novare valley, surrounded by 200 acres of vineyards in the territory of Negrar, one of the five villages inside Valpolicella Classica, the original Valpolicella and Amarone wine producing are. Giovanni Fattori bunkrupted and sold the unfinished villa to noble Mosconi family that completed it and had the beautiful central hall decorated with gorgeous frescoes representing ancient Greek myths, allegories of nature, agriculture and arts making the villa a quite lively cultural center. 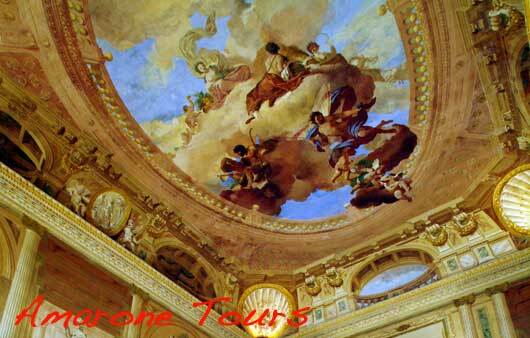 The painted ceiling of villa Mosconi-Bertani. The fresco represents Flora, goddess of Nature and agriculture, surrounded by personifications of the four season, Zephyrus, the god of winds and Apollo on his chariot. Unlike many other wineries in Valpolicella, where in the past wine was only part of a wider agricultural production that included grains, olive oil, fruits and was mainly made for local consumption in small cellars, here at Villa Mosconi-Bertani a big, functional and well equipped cellar was built from the beginning and used to produce big amounts of wine, also exported outside local markets. Valpolicella Cooperative Winery of Valpolicella bought the villa in the 30s of 20th century and made it its main cellar. According to the legend it is here that Amarone was made for the first time. In 1936, Adelino Lucchese, cellar master of the Cooperative Winery of Valpolicella, forgot a barrel of sweet Recioto that aged too long. Afraid of having spoiled the wine inside he tasted it and was so surprised by the very pleasant dry, bitter palate that screamed: «questo vino non è amaro, è un Amarone». «This is not a bitter wine, this is a great bitter». The wine was bottled here and released on the market for the first time in 1939 with the name Recioto Amaro: Bitter Recioto. In the early 50s Villa Mosconi-Bertani in Novare was bought by Bertani, already one of the most modern and important wineries in Verona province. Their headquarter was in Valpantena, on the eastern side of Verona, outside Valpolicella Classica. They wanted to produce wine in the hitstorical area of Valpolicella too so they bought the cellar and started a modern production of Amarone which has continued until today. They still have on sale 1958 vintages of Amarone! In 2011 Bertani winery and brand were bought by the Angelini Group that acquired also Villa Mosconi-Bertani historical vineyards, cellar and lofts for the drying of the grapes for the production of Amarone. Amarone Classico Bertani, with the drowing of Villa Novare on the label, now also belong to the new ownership together with other wines named after Villa Novare. 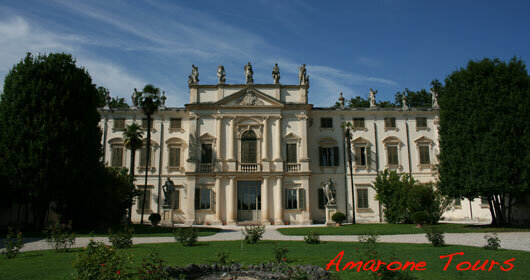 Bertani family still has the property of the villa and the beautiful romantic garden behind the building. Both can be visited during wine tours that are still possible in the estate. The tour of Mosconi-Bertani estate is a quite unique experience. Before the tasting there is a guided tour of the villa with its frescoed salon, the English style park with pond, romantic garden and the vineyards. It is not possible to visit the drying lofts and the cellar with the historical oak casks. The tasting takes place in one of the beautiful rooms of the villa and is accompanied by a tasty snack of bread, cheese and salami. Wines on tasting are those made in Bertani family’s new winery established in Coloniola ai Colli, in the eastern side of Verona province: Tenuta Santa Maria alla Pieve. Tasting usually includes Soave, Valpolicella Ripasso and Amarone. The tour at this estate offers the chance to taste excellent wines deepening the knowledge of Valpolicella and Amarone together with a visit to a gorgeous Italian baroque style country villa. Suitable both for individual wine tourists and groups. Villa Mosconi Bertani can also be rented and become a luxury location for wedding ceremonies, parties, events, meetings, cooking classes. For further information or to book an Amarone tour that includes Bertani winery in Villa Novare please contact us at: info@amaronetours.it or call +39 389 983 5269.